All through 1995 I worked on a graduate project in systems engineering at Oakland University developing my ideas about Inquiry Driven Systems. I wrote a project report on Peirce’s treatments of analogy and inquiry that included a return to Dewey’s Sign of Rain story and I drew what I think is a slightly clearer picture of the logical inferences involved in the abductive and deductive steps. 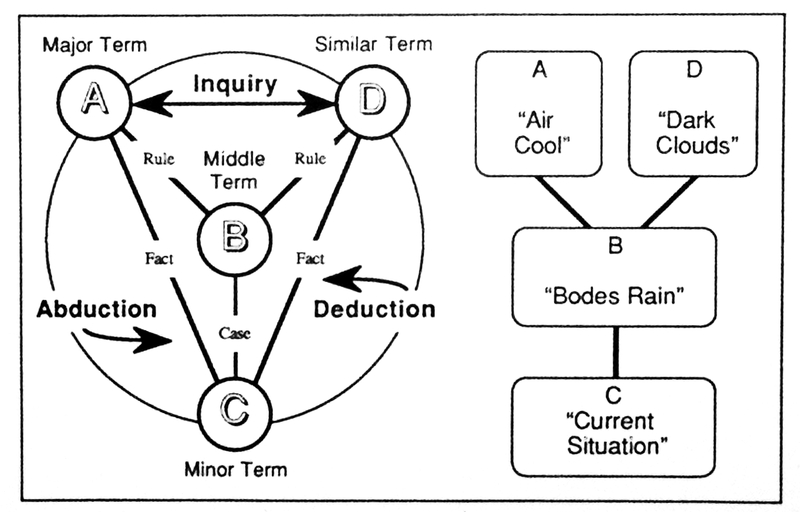 The above Figure charts the progress of inquiry in Dewey’s Sign of Rain example according to the stages of reasoning identified by Peirce, focusing on the complex or mixed form of inference formed by the first two steps. Step 1 is an Abduction that abstracts a Case from the consideration of a Fact and a Rule. In the Current situation the Air is cool. Just Before it rains, the Air is cool. The Current situation is just Before it rains. Step 2 is a Deduction that admits this Case to another Rule and so arrives at a novel Fact. Just Before it rains, a Dark cloud will appear. In the Current situation, a Dark cloud will appear. What precedes is nowhere near a complete analysis of the Sign of Rain inquiry, even so far as it might be carried out within the constraints of the syllogistic framework, and it covers only the first two steps of the inquiry process, but maybe it will do for a start. I wonder how the function implied by the word “inquiry” relates to induction and analogy, which are not labeled in your diagram. I discussed analogy briefly and gave links to readings in the first couple of posts of this series, way back in 2012. I wonder if the people who came up with Kabala thought what they were asserting was esoteric and magical, or whether they thought it was logical, real, true and common-sensible if you studied it? Back in the days when I was studying the work C.G. Jung and his school on archetypes and symbols of the collective unconscious, I absorbed mass quantities of arcane material from a number of esoteric traditions — alchemy, astrology, kabbalah, numerology, taoism, and a host of others. The one thing that eventually strikes every critically reflective student about the function of these pre-scientific paradigms is the way almost any conceptual scheme whatever serves good stead for unifying the manifold of sensuous massa confusa that assaults the bewildered mind, at least, until a better paradigm comes along. So I think there are continuities, developments, and evolutions of rationality and sensibility in this realm — the one recessive theme occurs in allowing oneself or one’s subculture to get stuck in a stagnant stream of consciousness.